You’ve heard a few of those statements before I’m sure. And for good reason, people for decades have stood by the advice that you should be growing your network at every chance you get. However sometimes the advice falls on deaf ears. Heck I know I’ve ignored it over the years myself. And the reason why is because I forgot the critical aspect of building solid networks and that is the relationships with REAL people. The people is what drives business, and it doesn’t matter the niche or market…People do business with those they know like and trust. And here’s the interesting thing about building those relationships…Everything…Is your network! That’s a quick note I wrote down when planning the talk today I did on the video below and on Facebook Live. Essentially, I asked myself in what areas of business am I growing my network? 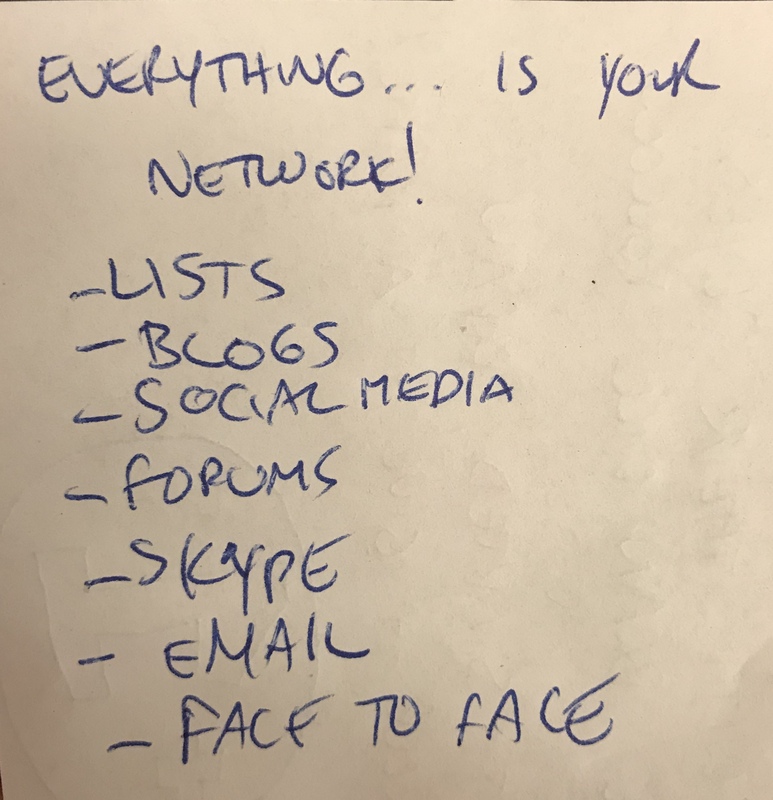 This took me about 15 seconds to come up with but I’m sure if I tried harder I could come up with another dozen or so ‘ways’ to grow my network. Everything I do, is to build that network. Whether it’s building email lists, writing content on my blogs. To social media, online forums, Skype group, personal one to one emails or offline events….We’re growing our network daily in all aspects of our businesses. John C. Maxwell has famously said – “Everything rises and falls on leadership” and I completely agree with that. I would just add that without a network of awesome people around you, it’s a guarantee you will ‘fall’. This is an important point Jon. People won’t succeed on their own. They need other people one way or another. All those, who became “overnight success” were actually working a lot longer than appears and most of them had a network of people supporting them in one way or another. So true. Even the most successful of people, online or off, surround themselves with a variety of people and learning to delegate or outsource what isn`t your forte can`t be done if you don`t network. Absolutely. You never know who you will meet. Fun fact, if not for the original Net Marketing Forum, my company would’t exist. That’s where we met each other. Hi, Jon. Great post and so true. Networking is very important. It takes time but it’s worth it and the best way to do online marketing! Thanks Barb and yup, completely agree! Make the net work for you, build and use that network. I always loved forums, so thanks for reviving NMF! I missed out its glory days but I think I would’ve loved it. Hey, Worrior Forum is still an excellent goto marketing resource. It would be great if NMF regains its shine. A great place to network and exchange marketing ideas! Agreed! It was a special place and I can see the DNA is still there even if we’re only a week old. When we get into the habit of networking, we will eventually be networking every day without even thinking about it. So crucial! Indeed True. Networking is most important. You can learn a lot of stuff from meeting people. For sure, one of the most important things you can do every day…Meet new awesome people!